Scholarships are anything but free money. They actually take a lot of work. 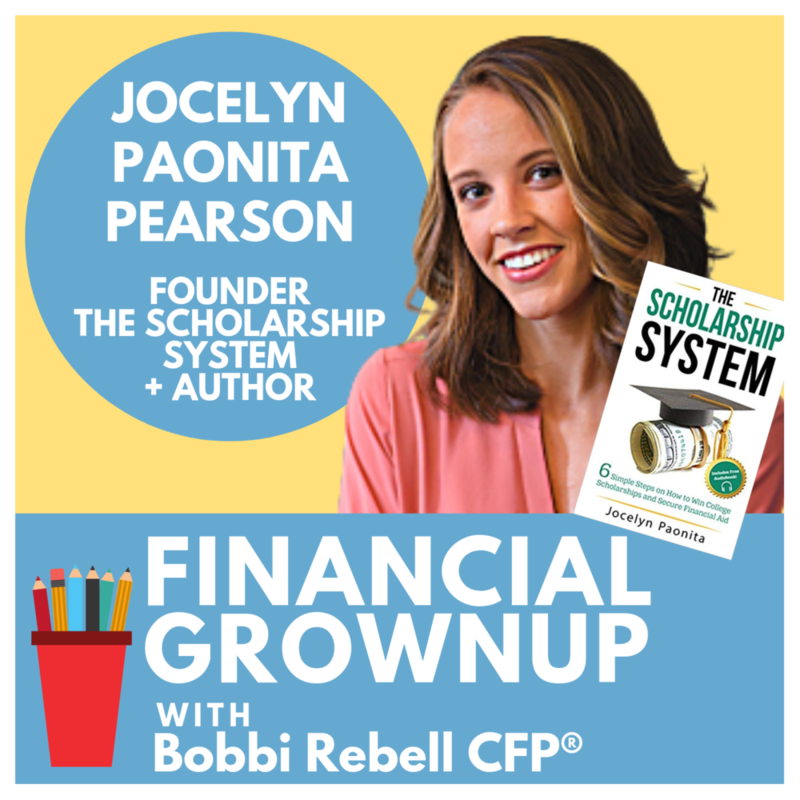 Jocelyn Paonita Pearson shares the story of how she graduated not just debt free, but also with cash to spare, all by knowing where to focus her efforts, and how to avoid the scholarship scams. Scams is a pretty harsh term, but I think it's fair, so these are the sweepstakes scholarships, the ones that are based on drawings. If it's based on luck, it is not worth your time. You're listening to Financial Grownup, with me, certified financial planner, Bobbi Rebell, author of "How to Be a Financial Grownup." You know what? Being a grownup is really hard, especially when it comes to money. But it's okay, we're gonna get there together. I'm gonna bring you one money story from a financial grownup, one lesson and then my take on how you can make it your own. We got this. Hello Financial Grownup friends. College, totally affordable, said no one ever. It's crazy expensive and every dollar that you can save is a really good thing. That much debt student debt on the other end. So glad I was able to get Jocelyn Paonita Pearson on the program. She is the master at finding money to pay for school and save precious time while doing it with a fantastic program called, The Scholarship System. Welcome, to everyone. If you're a new, we're so glad you discovered the show. We interview high achievers and get their money stories, and their lessons and even some every day money tips, all in about 15 minutes. If you have a little more time though, feel free to stack a few episodes together to make it work for you. With that, here is Jocelyn Paonita Pearson. Hey, Jocelyn Paonita Pearson. You're on Financial Grownup. Welcome to the podcast. Thanks so much for having me. I'm excited to be here. I'm excited to learn more about The Scholarship System because who doesn't need more money for education for themselves, for their children, for the future and so on. Tell us, just briefly, what it is before we get to your money story. Sure, so The Scholarship System is a six step process that I accidentally stumbled upon to pay for college without taking out student loans. Now, it started off as a simple book, but then we learned that our families wanted true live interaction and get some videos, worksheets, templates, you name it, and so now it is a full on course, blog and tons of resources for families to learn how to pay for college with scholarships. And we're going to circle back to that, but first, I want to get to your money story, which is actually very appropriate because that's actually how you came up with this. It all started with you and your own scholarship needs. Do tell. I would love to. So, it really was an accident. When I was in high school, my parents sat us down. I'm one of five kids, and they said, "We love you guys, but there is no way we could pay for college." Because at this rate it's half a million to a million dollars for this many kids, right? So, I was a pretty bullheaded teenager who just ... I did not want to take out student loan debt. Actually, I had watched Dave Ramsey's Financial Peace University in one of my high school classes and made me terrified of any kind of debt, nevermind just student debt. So, I started off on a path to get scholarships for college and I just, for some reason, assumed my university would give me a ton of money. They did not though. They give you very little, I got to say. $2,000, right? Oh my gosh. And what was tuition? What did that represent versus tuition? Tuition was I think around 10 grand a year, so I needed way more just for tuition, but the thing was my freshman year in college tuition was just half of my expenses. So, in the end, it cost me over 20 grand a year. So, yeah, they gave me, what? 10%? Yeah, and a lot of people don't understand that tuition is not everything. There's so much more that comes out of pocket. Not to mention the fact that ... sometimes your earnings are more limited than they might have been otherwise because you're studying, so you can't work as many hours as you might be able to if you weren't in school. There's that opportunity cost as well. And this was first happening in high school, I should say. You're in [crosstalk 00:04:24] figuring this out. What number are you among the five children? Did you have older siblings that had done this already? No, so I was the guinea pig. Yeah. So, I started looking for scholarships and spent my junior year, this was before I knew that I was not getting much money, but I spent my junior years nonchalantly applying. But what I was doing was I was applying to these, what I later found out, were pretty much scams. So, I wasted an entire year applying to scholarships that weren't legitimate. What do you mean by scams? What would they be? They would say there was a scholarship and then they would just get your data? What was going on? That's pretty much what it was. Scams is a pretty harsh term, but I think it's fair. So, these are the sweepstakes scholarships, the ones that are based on drawings. If it's based on luck, it is not worth your time, period. Are they legit? Like, if you win, it is at least legit. If you want to enter a lottery, it's not ... They're not taking from you. Your worst case scenario is you've wasted your time. I mean what is the danger of these scams? Because I don't know about this. Yeah, that's a great question. So, my inbox that I used for that, now has over 20,000 unread emails, and I'm not exaggerating, literally over 20,000. I'm sure it's way more now. Because what they did was they were taking my information and selling it to affiliate marketers. So, your inbox will pretty much be destroyed and whatever information you've given could possibly be given out. So, it's not that they're necessarily really hurting you, but in this day and age, our data is really valuable. So, it was a way for them to target teenagers especially. Who don't know better. Who are just looking to pay for their college education. Exactly. Which is the easiest, most vulnerable set of people to go after because everything is so scary and overwhelming with this process in itself. So, I got sucked into that. I did not know until finally the end of my junior year, I found a small little local scholarship that was 500 bucks, and I applied and wrote this essay. It was terrible. I had so many different drafts that I had to go back and forth and fix, but in the end, I won 500 bucks. Some people might be thinking, $500, you needed pretty much six figures to get a free ride. Why would you waste your time on $500? But that $500 scholarship meant so much more for me because what it did was it validated scholarships in general. It showed me, "Hey Jocelyn, there is money out there. There are scholarships out there. You just need to know what you're looking for, and apply to the right ones." What was different about that $500 one versus what you call the scams? You asked the best questions. This is one of the golden nuggets that we really harp on in our course, and it's to know if a scholarship is legitimate or not. There's really a spectrum. So I mentioned the ones that are based on luck, you throw your name in a drawing, and you're entered to win $10,000. Those are not worth your time. Even though people are like, "Well, someone has to win them." I have been doing this for now nearly a decade, and I've never met anyone to win one, so it's not worth your time. But on the other end of the spectrum, we have scholarships that asked for criteria that we compete, that shows our qualifications for money. Those are the ones that are worth our time. For example, I mentioned the one that I finally won $500 with required essays. That was something where, if I improve my essay, if I write a high quality essay, that increases my chances of winning. It's something within my control beyond just luck. So, in that way, it has a higher chance of being legitimate. The more it's based on my true credentials, and my competitiveness versus luck. And you eventually raised I think $126,000 to fund your education and the ancillary costs of that education, correct? Absolutely. So, in the end I got to six figures, and I was, not only able to graduate completely debt free, but I actually got an overage check every school year, every semester to pay for any external expenses that I had that were beyond my bill. So, What is the lesson for our listeners here that people don't know that's not obvious? Because there's a lot to this. It's not just write an essay. There's a strategy here. When I got my six figures in scholarships, it was not all in my senior year. It was gradual. Every single year I was able to apply for more and more money and it got easier and easier, I promise. That might sound like a lot of work, but once you get some winning ups, you just reuse them. So, that's actually a golden nugget as well. But every single year can get more money. A lot of people think, oh, once I finished high school, I'm out of luck. There aren't any more opportunities for me to change my status when it comes to loans or scholarships. That's not true. And the second one that I want to share is to find these scholarships, and we will share a free webinar, where I go in more depth and have more time about this, but we teach how to use Google the right way to find scholarships. I think one of the biggest challenges with the scholarship process is it's so overwhelming for students, where they go to Google, they look up scholarships, and they find a bunch of junk that doesn't even pertain to them. One of the smallest low hanging fruit tactics that we can teach that someone can implement in two seconds is to go to Google and Google their community or their zip code or their city name plus the word "community foundation." And oftentimes, community foundations have half a million, a million plus dollars to give out in scholarships. Right there, that one search can open the doors to, not just dozens of scholarships, but dozens have scholarships specifically for students in their area, which means it's less competitive. I want to get to your everyday money tip, which is very retro. It has to do with paper. Give it up Jocelyn. Yeah. This is so funny. Back in the day, if I will, when I was doing this, paper applications were more common, but believe it or not, they still are around. I know that's hard to believe, but there are organizations like the Elks Club or the Rotary Club, where some of them just aren't tech savvy just yet. And so, what they're doing is they're still sending letters to our guidance counselors saying, "Hey, we have this money, can you please share it with students?" A lot of schools are now doing great where they put that inside a student portal or put it on some sort of page for students, but there are still some that just stash that away inside a filing cabinet. I highly recommend students, go into the Guidance Office at their high school and also at their colleges. Again, remember this is not over in high school. A lot of scholarships don't even start or not available to freshmen. Sometimes they start at older grades. Right. And there's a reason for that. One of the reasons is because once you get to college, you have such a higher chance of graduating, so people want to make sure they're giving the money to the highest chance of someone that would do something with it. I never thought of it that way. That is so interesting. But a lot of this that you talk about in the scholarship system is that it's about effort, but it's also about knowing which scholarships are less competitive because some scholarships don't have that many people applying. We're talking about these paper applications where you have to physically go into the office IRL and asked for them. That gives you a big leg up. Absolutely, Bobbi. That's the one thing is ... a lot of students, they go after the Dr Pepper Scholarship or the Coca Cola scholarship, where it's a free ride in one shot, but the problem is everyone is going after that one. And even I, I applied for the KFC one, I didn't get it, but that was a really competitive one. And then when I realized, you know what? That $500 one, $1,000 one, $1,200 one, they still add up pretty quickly and yet, I'm competing against ... actually, just a quick story. Once, ISM had an application and they had two awards that they were going to give out. And this was a local based one. In the end, they only received four scholarship applications, so they doubled the award and gave all four of us an award. So, it was 100% success rate because it was one of the lucky ones. You have to just try. Okay, before we wrap up, I want to hear what is going on with the scholarship system. You have a webinar, first of all, so tell us about that and how else people can learn more about you and all your social channels. Absolutely. I appreciate that. So, we have a free webinar that we hold. It's around an hour to an hour and 15 minutes. I go in-depth about some very large myths, which we did burst a few here, but I go in more depth on those in the Webinar, as well as a very specific places you can look, including more detail on how to use our Google method. So, if you're interested in joining our webinar and registering, it's completely free. You can go to, we created a unique link just for Bobbi's audience. So, you go to the scholarshipsystem.com/grownup. This is for parents and students. Actually, if you can attend together, that's even better. So, that's the best place to get ... just hit the ground running when it comes to finding these scholarships we're talking about. The low hanging fruit, the ones that have a greater chance of winning and get started. Then, if you want any additional information, I love our Facebook page. We share scholarships on there as well as tons of helpful articles, our own and others. So, you can just go to Facebook and search "The Scholarship System." And then our website, we have a weekly blog that we give and these are massive, actionable in-depth blog posts and you can just go to the scholarshipsystem.com for those. Thank you so much. This is all so important. And you're really creating the shortcuts because we're all so busy, so this is kind of a central place for everyone to go. So, thank you, Jocelyn. Hey friends. Here is my take. Financial Grownup tip number one, scholarships are not limited to educational institutions. Many professional conferences have them. In fact, usually the information on how to apply is right on the website, but you can also just write to the people running the conference and find out. For example, one of my favorite events, The Lola Retreat, run by Melanie Lockert, who has been on this podcast, we'll link to her episode, offer scholarships, including one financed by this podcast. Another conference that I attend that offer scholarships is Finncon. It is run by Philip Taylor, Aka PT Money, also has been on this conference, and they offer scholarships for content creators that are looking into the industry or growing their business and aren't really financially able to attend. Totally worth applying to all these kind of conferences and seeing if there are scholarship money available. Financial Grownup tip number two, if you do graduate with debt, student debt I should say, consider looking for jobs that have programs to help pay down those loans or that will pay for graduate school so you don't take on more debt. It is becoming more common in this tight job market. Thank you, to everyone, for being here with us. Please share with friends and be in touch with your tips on paying for education, both school and professional developments. On Instagram, I am @bobbirebell1 and Twitter, @bobbirebell and you can always email us at hello@financialgrownup.com. And by the way, I have a new podcast, in addition to this one. Financial Grownup is not going anywhere. It is with my friend Joe Saul-Sehy of Stacking Benjamins' fame. It is called, Money in the Morning. We talk about headlines and break down what matters to you, and we tape it live on Facebook. We will leave links to where you can join us in the show notes. Big thanks to Jocelyn Paonita Pearson for helping us all get one step closer to being financial grownups.